What is The Service Collaborative doing for WNY. choose to dedicate this time in their lives to service. Your support for The Service Collaborative of WNY is far more than a feel good donation. The first upstate project under a first-of-its-kind community service initiative called "Film Good/Do Good". This week The Service Collaborative is embracing the opportunity to tell the story of service in Buffalo and Western New York. We know that stories are being written daily by our National Service members, their sites and the alumni that have come and gone from our programs. 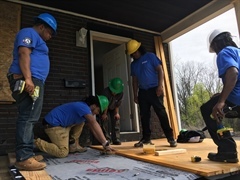 "As the service months go on however, I have seen indirect service build the foundations of a project that could eventually expand beyond my office and serve fourteen counties in New York state." 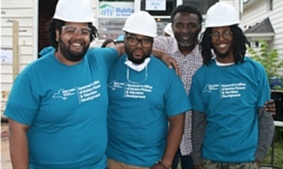 "YouthBuild and AmeriCorps have changed me in many different and positive ways. I am more accepting, more caring, and more responsible. I am more open to helping others in need, and even enjoy volunteering." "Serving two AmeriCorps terms has, as cliché as it sounds, changed my life. Originally from a Rochester suburb with a vague degree in political science and really no direction in life, I stumbled upon the ABLE program in Buffalo."